The Rock Geochemical Database of Finland data set describes the concentrations of major and trace elements in the bedrock of Finland. In all, 6544 samples were analysed for the total and partial concentrations of 57 elements using several different methods (XRF, ICP-MS, ICP-AES, GFAAS). The samples were taken during 1990-1995 with a mini-drill from rock that was as unaltered as possible. The sampling density varies between one sample per 30 km2 and one sample per 120 km2. The chemical analyses of the data were performed during 1992-2001. The reproducibility of the analytical results and the analytical drift were estimated using 375 duplicate sample pairs. The lowest reliable concentration was determined for each element and analytical method. In addition to the chemical concentrations, the database contains spatial data and several geological attributes for each sample. 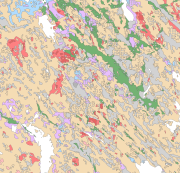 The data set and its manual were published in 2007 and they are available via the web site of the Geological Survey of Finland (GTK). 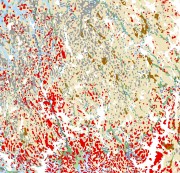 The Superficial deposits of Finland 1:1 000 000 is based on 'Quaternary Deposits of Finland and Northwestern Part of Russian Federation and their Resources (Sheet 1, Western part)' mapping data. This data is also based on the 1984 map 'Quaternary Deposits of Finland' (1:1 000 000) in the “Geologia” (Geology) folio of the Atlas of Finland, 5th edition (123-126, 1990). Joint scientific and technical planning for the map of the 'Quaternary Deposits of Finland and Northwestern Part of Russian Federation and their Resources' was begun in 1987 while work on the map started in 1988. No field mapping was done for the map, rather the 1:1 000 000 Quaternary map printed in 1984 was supplemented with new data partly obtained from rock aggregate studies and partly from information on superficial deposits gathered in other superficial mapping projects. The map 'Quaternary Deposits of Finland and Northwestern Part of Russian Federation and their Resources' was printed in 1993. 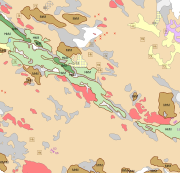 The map shows the superficial deposits with colours and symbols and these are classed according to their mode of geological development. The deposit classes are as follows: pre-Quaternary bedrock exposures (no Quaternary layers); boulder field, physically weathered bedrock; gravelly and sandy till; silty till; clayey till; hummocky moraine ; moraine complex; esker, delta, sandur, sorted marginal formation; interlobate formation (esker); till-covered esker / other till-covered gravel and sand deposit; gravel and sand deposit peripheral to eskers; littoral gravel and sand deposit; fluvial deposit; homogeneous clay and silt deposit; layered (varved) clay and silt deposit; peat deposit. Additionally, drumlins, end moraines, aeolian deposits, and sites of gravel, sand, clay and peat extraction as well as gold panning areas have been indicated with symbols. The data set was converted to a digital format to meet the needs of the OneGeology-Europe Project for a printed map in 2009. This data did not include drumlins, end moraines, aeolian deposits, and more important sites for the exploitation of superficial deposits (sites of gravel, sand, clay and peat extraction as well as gold panning areas). In accordance with the 1984 Quaternary map (1:1 000 000) the minimum size of the deposit polygon is generally one square kilometre. In nature the size of superficial sedimentary deposits is usually smaller than one square kilometre and therefore the most common deposit type in the area is shown in the polygon. In places, deposits smaller than a square kilometre that are significant from a superficial perspective have been noted. As a rule, the narrowest point of the deposit polygon was 0.5 km and in important cases, for example on eskers, 0.3 km. As an exception, the size of small eskers has been exaggerated. 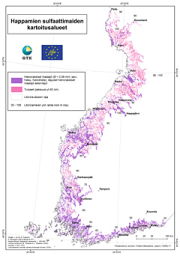 Coordinate reference system of the Superficial deposits of Finland 1:1 000 000 was transformed in October 2013. The transformation from Finnish National Grid Coordinate System (Kartastokoordinaattijärjestelmä, KKJ) Uniform Coordinate Frame to ETRS-TM35FIN projection was done by using the three-dimensional transformation in accordance with the recommendations for the public administration JHS154. The water layer which were used in the OneGeology-Europe project was replaced in 2015 with the more accurate water layer of the Topographic database 1:55 0000-1:500 000 (DVE3) from ICT Agency HALTIK. The Regional Stream Water Geochemical Mapping data set gives information on the elemental concentrations in organic sediments of small headwater streams. The samples have been taken from small headwater streams (catchment area under 30 km2) in the late summer of 1990. Sampling has been repeated for about every fourth point during the years 1995, 2000 and 2006. The number of samples was 1162 in 1990 (at a density of one sample / 300 km2), 286 in 1995, 286 in 2000 and 249 in 2006. 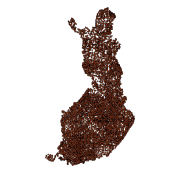 The data set covers the whole of Finland. Stream water samples have also been taken at the same time. Sampling, processing and analysis methods have been described in the Geochemical Atlas of Finland, Part 3, p. 27 - 30 (Lahermo et. al 1996). Field observations, coordinates and element concentrations determined from samples have been made into a database, in which each record represents one sample point. The data for each sampling year have been recorded on different tables. The method of analysis is referred to with a four-character method code. The codes are as follows: 503H = mercury determination using the cold vapour method 503P = nitric acid extraction in a microwave oven, measurement with ICP-AES 503M = nitric acid extraction in a microwave oven, measurement with ICP-MS 820L = carbon, hydrogen and nitrogen determination with a LECO analyser. The element concentration data include a numerical concentration value (as mg kg-1 or ppm) and possibly a check mark. The concentration is recorded as a variable, which has a name that comprises the chemical symbol for the element and the code for the method of analysis. For example AS_503M is arsenic (As) concentration, which is determined with the ICP-MS method (503M). The next variable has a check mark, for example AS_503MT. If the numerical value following the check mark is ‘>’ or '‘<’ then the number recorded in the concentration field is the determination limit of the chemical analytical method used and the actual concentration is less than this value. If the check mark is an exclamation mark (! ), the analytical result is smaller than the determination limit of the analytical method use but the (unreliable) value obtained with the measuring instrument has been entered in the database. There is no data are if the check mark is a 'x'. The original purpose of the Regional Stream Water Geochemical Mapping data set was national general geochemical mapping and the basic assessment of environmental state. Other uses are, for example, the assessment of changes in environmental state and determination of the baseline concentrations of surface water as part of the evaluation of the chemical state of catchment areas in accordance with the Water Framework Directive of the EU.